We have quite a few tips and tricks that can you some time stress and best of all, money on your upcoming move. You can download our moving guide for more information, but here are some of the tips and tricks for you! Pack up your belongings yourself. We recommend buying your boxes from us or from a source like UHaul. Getting free or used boxes may seem like a savings (IE Liquor Store Boxes) but we can move much quicker with uniformed sized boxes as they stack much more efficiently on the truck. 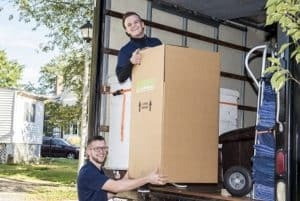 Avoid this at all costs and help your movers! Use Large Boxes only for bigger light weight items like linens and pillows and shoes. Don’t be tempted to load up a large box with heavy items! We won’t be able to lift it safely or the box will rip open. Be sure to tape and label your belongings with the room they are destined for! Use packing paper instead of bubble wrap or peanuts. The latter can be very expensive! Crinkle up your packing paper and use it as a base and in between fragile items. TIP: If you can hear some glass clinking together, the box needs to be repacked. It WILL shatter if you can hear glass on glass. We ask that all jewelry and/or any other items of extraordinary value are moved prior to our crew’s arrival. This ensures safe transit of your most precious belongings and limits liability. Do you have a lot of items or boxes in your basement? If you are able to move items neatly into a foyer or garage to cut down on walk time, we can load up or unload much quicker, saving you money on your move. Cut down on the junk! It is cheaper for us to come out in advance and hire us for our junk removal services than for us to move it into your new home. We can bring unwanted items to Good Will or the junkyard for you. If you have time and do not want to pay to have furniture in good condition removed, contact a Good Will, Salvation Army or a Consignment shop to come out and pick it up. This will cut down on the moving inventory and save you money!